Detailed guide for the Cooperation Guide for the Temperance Arcana. We will update this as we go along. 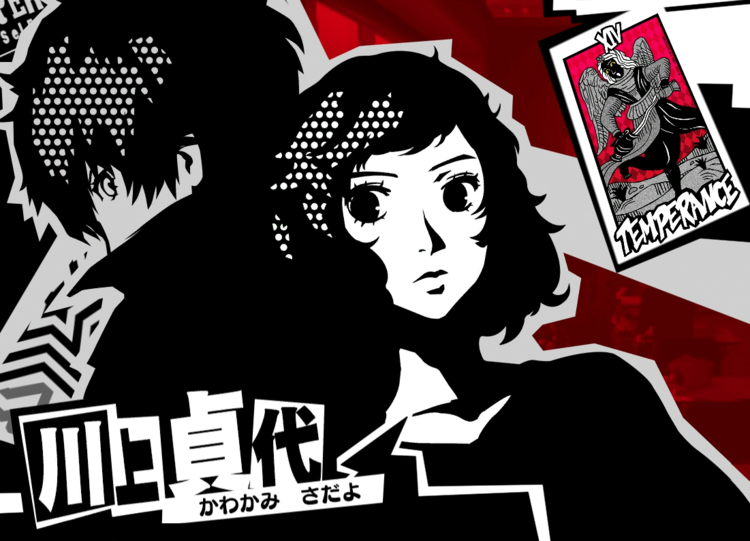 The Temperance confidant has Sadayo Kawakami as its holder. When you unlock the Temperance confidant, she can perform certain services for a fee. Sadayo Kawakami is the protagonist‘s homeroom teacher. At first, she appears to be cold. She did this because of the alleged problem student status the protagonist has. However, after he stands up to Kamoshida, she becomes noticeably nicer. She begins to look after the protagonist and helps when he goes through palaces. She is unlocked as a Confidant on May 24 when Yuuki finds a flier about a maid cleaning service. She is available during Friday and Saturday Evenings. Place a call from the phone in Cafe LeBlanc. 1 Sabotage Kawakami doesn’t mind you being lazy in her class. During these moments you can read books, produce infiltration tools, doze off, or review/study. 3 Housework Agent Kawakami can make coffee or do laundry for you. The act is done by her while you do other tasks at night. 5 Full Sabotage Kawakami will now interrupt other teachers’ lectures to let you be lazy in class. 7 Super Housework Agent Kawakami can cook Curry and make Infiltration Tools for you. 10 Special Massage After visiting the other world, Kawakami can give you a massage and thereby allow activity at night. The Confidant begins on 5/24. When you complete the second dungeon, Ryuji will give you a flier about a maid service. When you’re done, talk to Mishima. Head to Shibuya. After the event, talk to Kawakami in front of the Faculty Lounge. She will give you her phone number. You can call her phone. Rank 2 Guts Required. Costs 5000 yen per call. Unlocks Slack Off, which allows you to spend occasional class hours doing various other tasks. If you’re romantically involved with her before you go to Hawaii, you can spend one day with her and she will give you a +5 ma/+5lu ring. i’m rank 9 and the confidant won’t go up to rank 10.
the outline of her name in the fast travel map is greyed out and she keeps sayin she’s on break if I call her on the yellow phone. My friend and I are having the exact same problem. You are having the “teacher on summer break, but the next confidant trigger is at school” problem huh. How do I unlock her mementos request? I’m at rank 8. Ugh! If you want the Romantic Option SUCCESSFULLY, you have to choose “I’m a man, you’re a woman”, choosing the other will just cause her to go home.